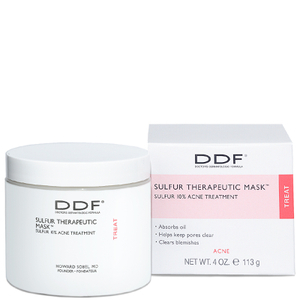 Colloidal Sulfur Mask is a dermatologist formulation that clarifies the skin by absorbing oil and acne-causing bacteria. The advanced, time absorbent formula works especially well when worn overnight. 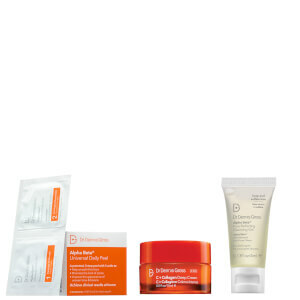 Pores will appear reduced, blackheads will be minimized, and overall clarity will be enhanced. Absorbs excess oil and diminishes pore size. Calms redness and irritations with Prickly Pear. Recommended for combination to oily skin types. Cleanse skin thoroughly before applying and apply a thin layer to the affected area one to three times daily. Leave on for 10 minutes, then rinse. May be worn overnight and washed off in morning. Suitable for use on face, chest and back. If bothersome dryness or peeling occurs, reduce frequency of application. Water (Aqua), Kaolin, Colloidal Sulfur, Glyceryl Stearate, Glycerin, PEG-100 Stearate, Butylene Glycol, Cetearyl Alcohol, Aloe Barbadensis Leaf Juice, Zinc Oxide, Bentonite, Carthamus Tinctorius (Safflower) Seed Oil, Opuntia Tuna Flower/Stem Extract, Salix Alba (Willow) Bark Extract, Bisabolol, Glycyrrhiza Glabra (Licorice) Root Extract, Farnesol, Rosmarinus Officinalis (Rosemary) Leaf Oil, Phenylethyl Resorcinol, Retinol, Tocopheryl Acetate, Sodium PCA, Ethylhexylglycerin, Allantoin, Polysorbate 20, Phenoxyethanol. This mask is great for treating some occasional breakouts, especially those that stay under the skin and HURT. When I get them, I also use as spot treatment before bed and wash it off in the mornings. I haven't seen these breakouts shrink so quickly before. I've always had oily skin and would still break out (and I'm in my 30s). Once I started using this sulfur product, I noticed that the flare ups stopped. FINALLY!! Love this product. Also controls my shine. So if benzyl peroxide and salicylic acid aren't working for you, I'd definitely recommend trying this product. Hooray for sulfur. skin glows after using this product. It is especially effective if used in concert with the daily peels in this line.